Park to Spark > Insights > Anxiety? Park to Spark® recently visited a potential client in Philadelphia. 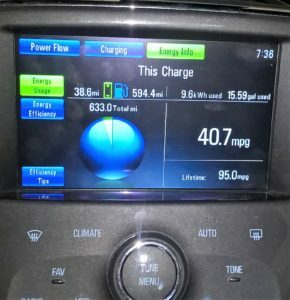 We drove our Volt to/from Philly with several other site visits along the way. We charged at home overnight . We didn’t charge again during the trip. The Volt, thanks to its on-board generator, made the 633 mile round trip from the Park to Spark® HQ with no anxiety–Range or otherwise. The trip did require one pit stop as we used 15.59 gallons of stinking gasoline. Our EV trip was, well, just a trip. Some would complain that the Volt used gasoline. “Only 40 MPG is awful” they might say. But, think about it: Our commute driving for the other 4 days of that work week was 100% EV travel since we use home and workplace EV Charging. About 250 other miles that week were gas free. At Park to Spark®, we believe all EVs are good-even the ones that use gasoline when their battery is empty. Please contact us to learn how we can help you understand EVs and how workplace charging can make sense for all EV types.